Fantastical ideas for fantastical weddings! This DIY kit is perfect for anyone planning a ‘Vintage Tea Party’ themed wedding. Really quick and easy, and an original idea to use for place cards. As many tea bags as you have guests. Any brand which has tabs. Double sided tape, or glue. A computer and a printer, or good old fashioned pen and paper. All you need to do now is design your own personalised tab. 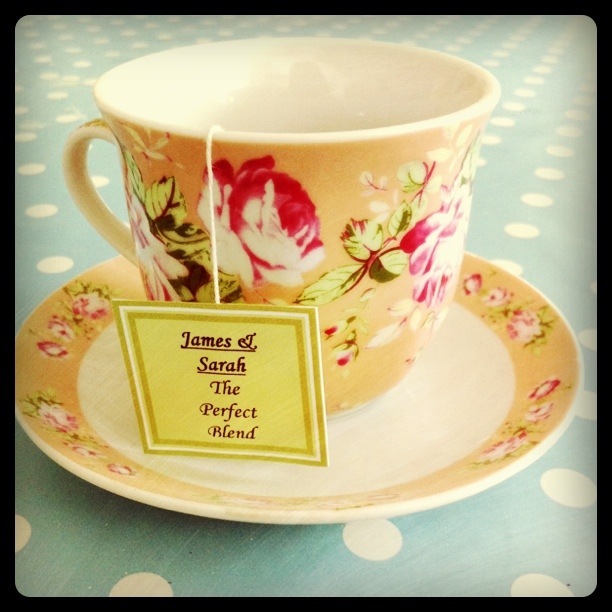 The one photographed has the guest’s name on one side and ‘James & Sarah, The Perfect Blend’ on the other, but you can go for whatever will fit in with your theme. I made my tab like a little book, I cut the old tab off and trimmed the string so that it would fit in my chosen tea cup nicely. I then cut a similar sized piece of double-sided tape and stuck it on the inside of the right page, then sandwiched the string in between before pressing the two together. Here is a chance to really show of your personality and creativity on a shoe string budget. If you don’t fancy printing your design off the computer you could do it all by hand. Write in calligraphy pen or use transfers, stick on lace, buttons or ribbon, use fabric as a base, floral, polka dot, stripes, incorporate pages from old books, atlases or dressmaking patterns… the list goes on. You can make this as quick or as intricate as you like, but either way, it’s going to be a talking point! 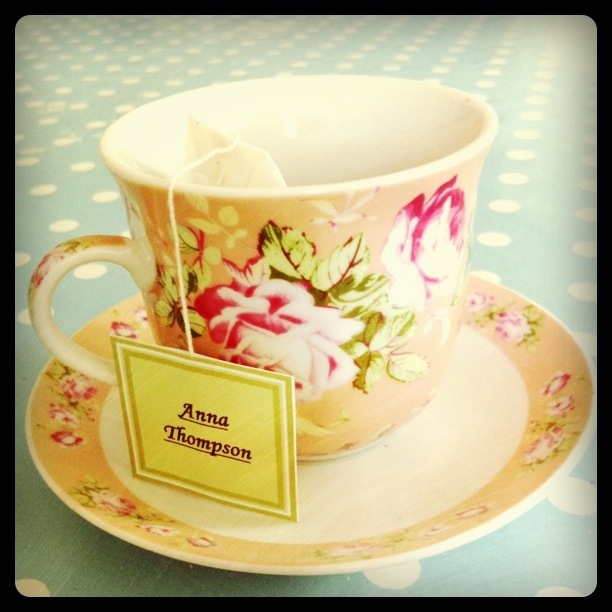 If you are looking for more ideas for a ‘vintage tea party’ themed wedding have a look at our vintage themed wedding page. If you’re looking for Vintage themed wedding entertainment check out the fabulous bands and musicians at http://www.thebandboutique.co.uk/vintage-entertainment/. A crazy busking band playing new pop tunes in a vintage style.If you’re looking for something different, this is the band for you! Great Scott are a unique wedding band, playing the best in pop and rock with a folk twist! Classic Kanish play all your favourite songs in a vintage party style! They are guaranteed to get all of your guests up and dancing! Cafe Bohemia play a great mix of gypsy jazz classics and contemporary songs done in a gypsy jazz style. Vintage styled 4-piece playing the best in gypsy jazz and swing. A unique act for your wedding. The Belles are a 1940’s female harmony trio, ideal for entertaining your guest at your wedding reception. If you’re looking for a gypsy jazz style wedding band, then The Riviera might just be for you! The Skip Jacks are ideal for Festival weddings, and play 2 different styles; folk and electric. Mister Kanish are a great rock & pop wedding band with an awesome live sound! Greg is an acoustic singer, ideal for entertaining guests during drinks receptions and ceremonies. London Funk Project are an awesome party band, and are sure to get all your guests dancing! The Deputies are one of Essex’s best pop and rock wedding bands.They can perform from a 3 piece, all the way up to an 8 piece. An amazing folk styled wedding band from Surrey made up of some fantastic musicians.